After the mouse incident, I was prepared for another mouse or two from Gracie. What I was not prepared for were the rabbits she brought home yesterday and this morning. 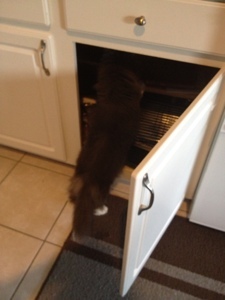 Logically, this is what cats do – they hunt. But I still feel incredibly bad for everything she chases. So … we are attempting a low tech solution. Collar with a bell. 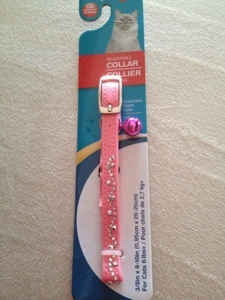 I went for the pinkest, sparkly-ist, girly-ist collar I could find … With a bell. Gracie hates it. 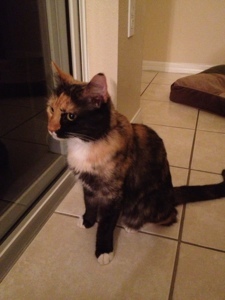 She had hidden under the bed, under the entry table, under the couch and in my closet. I just put it on her after work today. I am hoping she gets accustomed to it and it no longer bothers her, but I get the strange feeling she will either figure out how to take it off, or just stay out for a few days, pouting. Either way, I want to give the small critters of the neighborhood a fighting chance. On a lighter note, I had help making dinner tonight.